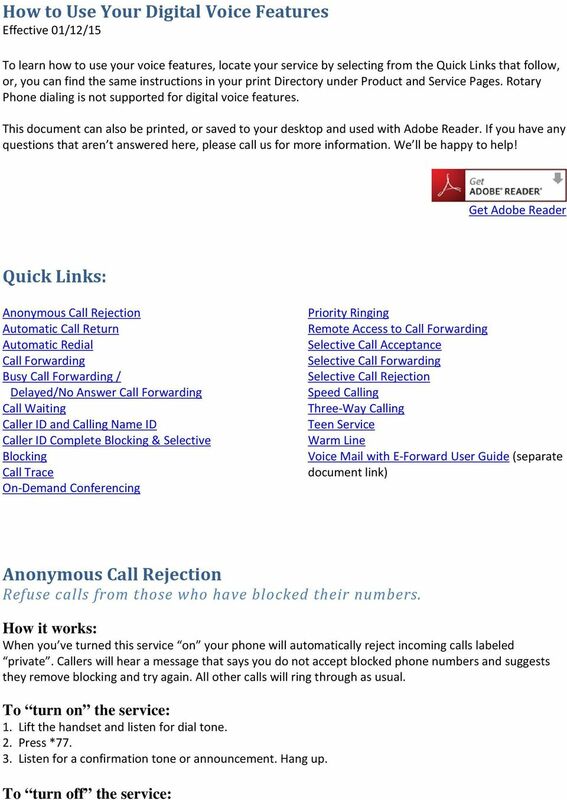 Download "Anonymous Call Rejection Refuse calls from those who have blocked their numbers." 2 1. Press * Listen for a confirmation tone or announcement. Hang up. You will not be notified when or how many calls have been rejected. Will not refuse calls displayed as unknown or out of area. Automatic Call Return Easily dial your last caller even if you didn t answer If you couldn t get to the phone in time, you can still find out who called. Return the call by dialing *69. This service is available to you on-demand, as a pay-per-use service for $.75 per activation up to a maximum monthly charge of $6.00, or by subscription service for $3.50 per month for unlimited access. 1. Lift the handset and listen for a normal dial tone. 2. 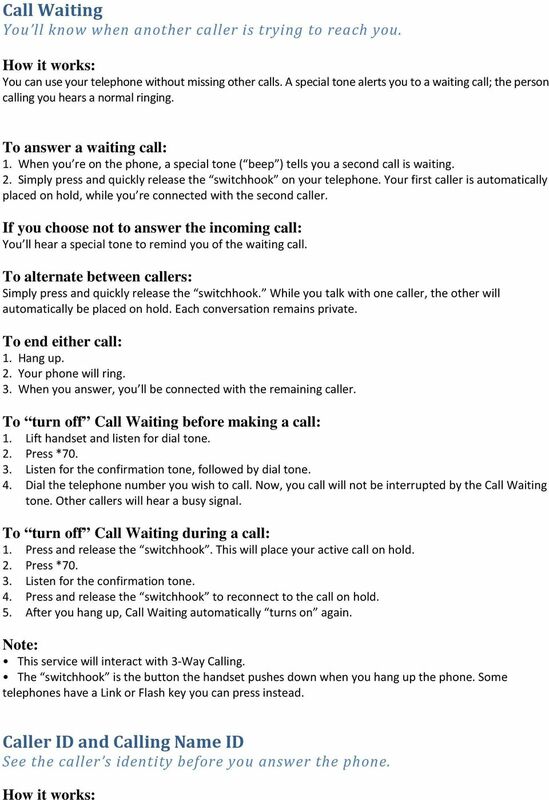 If you were already on the phone and ignored a call waiting tone, press and quickly release the switchhook. 3. Press *69. Your call will go through like a normal call. If the line is busy: 4. Hang up. Your phone will keep trying the line for up to 30 minutes. 5. A special callback ring alerts you if the line becomes free. (Some phones ring normally.) 6. Lift the handset to automatically place the call. To cancel your Automatic Call Return request: 1. Press * Listen for the confirmation tone or announcement. Hang up. The switchhook is the button the handset pushes down when you hang up the phone. Some telephones have a Link or Flash key you can press instead. Can be used on a pay-per-use basis or set up with unlimited use. Automatic Redial Get through to busy numbers as soon as they re free. You can save time dialing busy numbers over and over when you use. Set your phone to redial for you using *66. Your phone rings you as soon as the line is free, and automatically connects you. This service is available to you on-demand, as a pay-per-use service for $.75 per activation up to a maximum monthly charge of $6.00, or by subscription service for $3.50 per month for unlimited access. 1. When you hear a busy signal, press and release the switchhook. Listen for a special tone. 2. Press *66. Hang up. 3. Your phone will check the number for up to 30 minutes. 4. 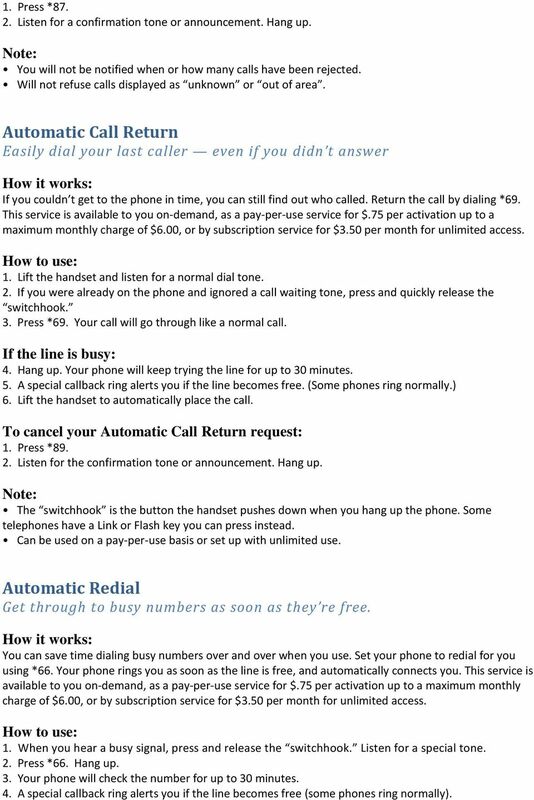 A special callback ring alerts you if the line becomes free (some phones ring normally). 3 5. Lift the handset to automatically place the call. To cancel your Redial request: 1. Lift the handset and listen for a normal dial tone. 2. Press * Listen for a confirmation tone or announcement. Hang up. The switchhook is the button the handset pushes down when you hang up the phone. Some telephones have a Link or Flash key you can press instead. Can be used on a pay-per-use basis or set up with unlimited use. Call Forwarding Let your calls follow you to another number. You can program your calls to ring at another number. Each time a call is forwarded, your phone will make one short ring. It can still be used to make outgoing calls. When call forwarding is active and you pick up your telephone handset at home you will hear a brief stutter dial tone. To turn on the service: 2. Press * Listen for the confirmation tone, followed by dial tone. 4. Dial the number where you want your calls forwarded. Dial the number exactly as if you are calling directly. See Note. (You can use Speed Calling Codes here if you have this feature.) 5. Listen for the confirmation tone, followed by dial tone. Hang up. To turn off the service: 2. Press * Listen for the confirmation tone, followed by dial tone. Hang up. Your Call Forward is now off, and calls will ring normally on your phone. To change the forward to number: 1. Turn off Call Forward. 2. 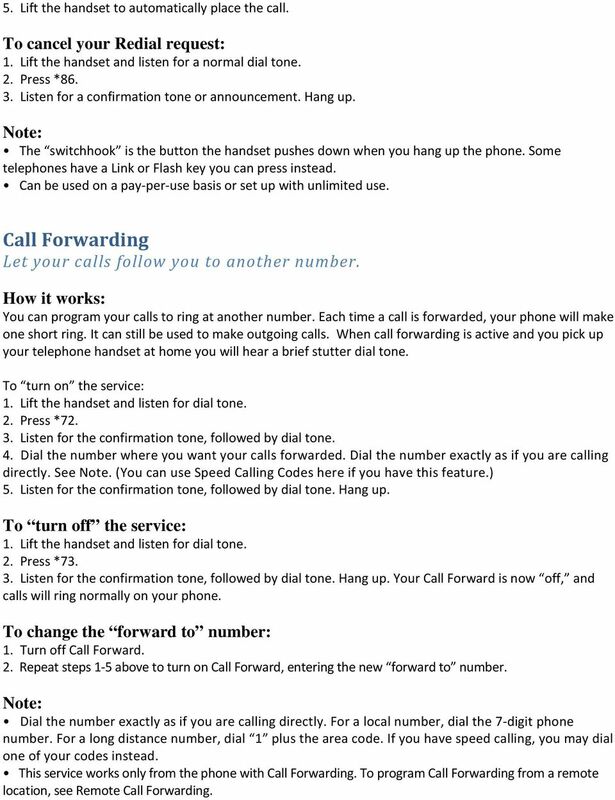 Repeat steps 1-5 above to turn on Call Forward, entering the new forward to number. Dial the number exactly as if you are calling directly. For a local number, dial the 7-digit phone number. For a long distance number, dial 1 plus the area code. If you have speed calling, you may dial one of your codes instead. This service works only from the phone with Call Forwarding. To program Call Forwarding from a remote location, see Remote Call Forwarding. 4 Busy Call Forwarding When your line is busy, your callers can reach someone else. Busy Call Forwarding and Delayed/No Answer Call Forwarding are part of the same feature bundle, so you can take advantage of more call forwarding options! Whenever you re on the phone, you can be sure your callers can talk with someone else or can leave a message for you. Easily turn it on or off, or change the forwarding number anytime. To Set up feature options contact Ponderosa at (559) : This service offers customizable options and must be set up by Ponderosa before you use it. 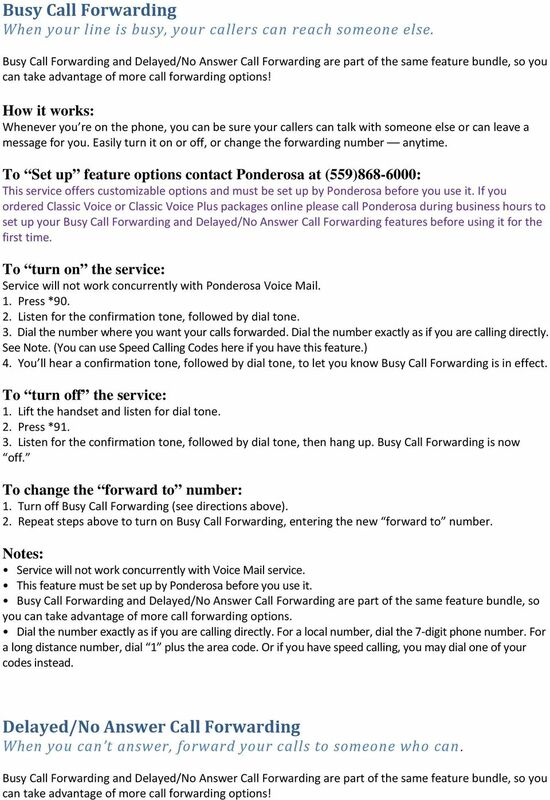 If you ordered Classic Voice or Classic Voice Plus packages online please call Ponderosa during business hours to set up your Busy Call Forwarding and Delayed/No Answer Call Forwarding features before using it for the first time. 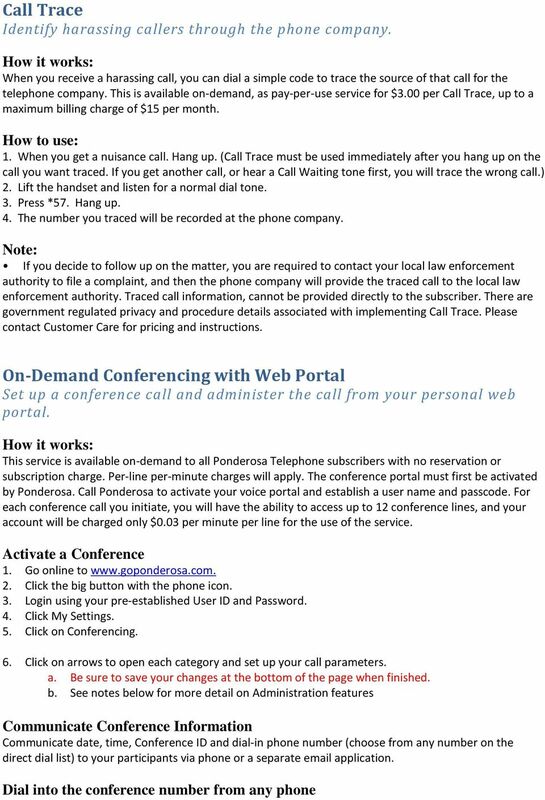 To turn on the service: Service will not work concurrently with Ponderosa Voice Mail. 1. Press * Listen for the confirmation tone, followed by dial tone. 3. Dial the number where you want your calls forwarded. Dial the number exactly as if you are calling directly. See Note. (You can use Speed Calling Codes here if you have this feature.) 4. You ll hear a confirmation tone, followed by dial tone, to let you know Busy Call Forwarding is in effect. To turn off the service: 2. Press * Listen for the confirmation tone, followed by dial tone, then hang up. Busy Call Forwarding is now off. To change the forward to number: 1. Turn off Busy Call Forwarding (see directions above). 2. 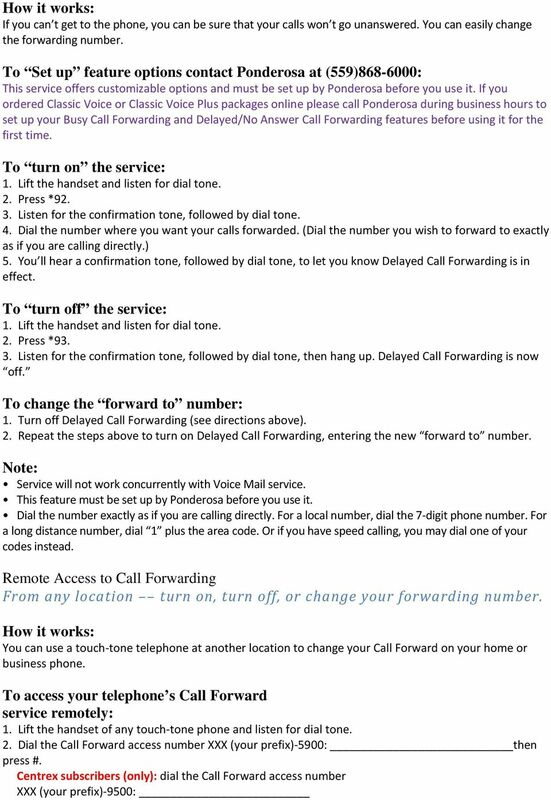 Repeat steps above to turn on Busy Call Forwarding, entering the new forward to number. Notes: Service will not work concurrently with Voice Mail service. This feature must be set up by Ponderosa before you use it. Busy Call Forwarding and Delayed/No Answer Call Forwarding are part of the same feature bundle, so you can take advantage of more call forwarding options. Dial the number exactly as if you are calling directly. For a local number, dial the 7-digit phone number. For a long distance number, dial 1 plus the area code. 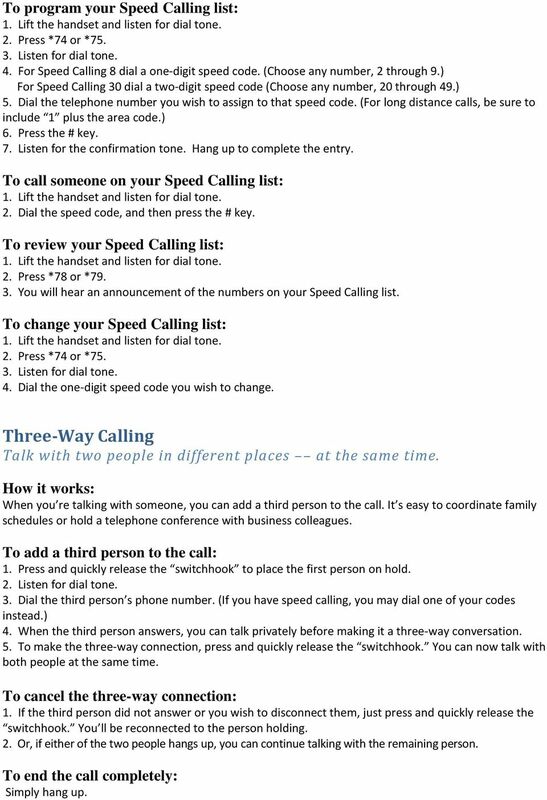 Or if you have speed calling, you may dial one of your codes instead. Delayed/No Answer Call Forwarding When you can t answer, forward your calls to someone who can. Busy Call Forwarding and Delayed/No Answer Call Forwarding are part of the same feature bundle, so you can take advantage of more call forwarding options! 6 3. After the line rings, enter your ten-digit home or business telephone number that has Call Forwarding service. 5. Enter your Personal Identification Number (PIN) then press #. 6. You are now ready to change your Call Forward. Proceed with one of the three Call Forward functions: Call Forward, Busy Call Forward, Delayed Call Forward, Selective Call Forward. Selective Call Forwarding Decide which callers should follow you to another number. You can program your phone to forward only those calls from a special list of up to 10 numbers to another number such as your smart phone. When your service is turned on, calls from numbers in your forward list will be re-routed to your forward-to number. All others will ring at your phone as usual. 2. Press * Listen for an announcement telling you whether the feature is currently stored in your forward list. 4. Follow the voice instructions. Turn the feature ON (if it is currently off). Press or dial 3. To turn the feature on for the first time you must first add a number to the list: To add a number to your forward list: 1. Press #. 2. Follow the voice instructions. To add the last caller to your forward list: Press #01#. To hear the phone numbers on your list: Dial 1. After the list is read, voice instructions will follow. To remove a number from your list: Press *. 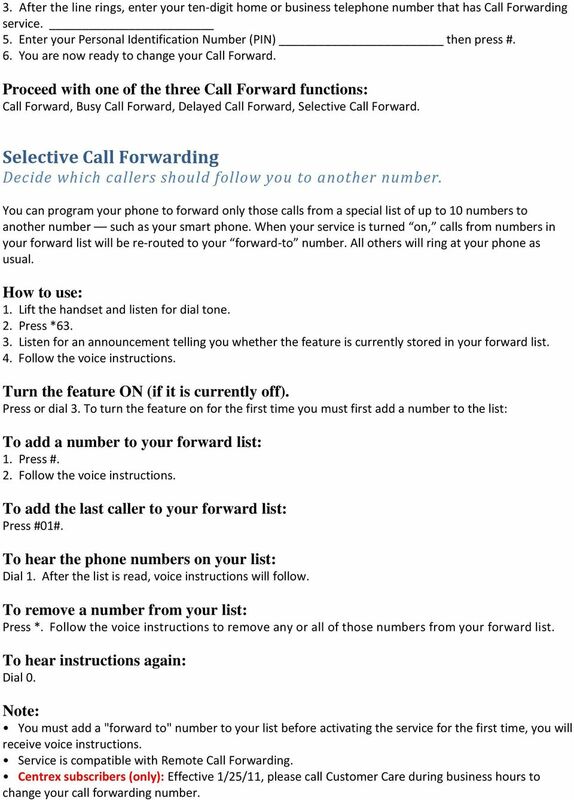 Follow the voice instructions to remove any or all of those numbers from your forward list. To hear instructions again: Dial 0. You must add a "forward to" number to your list before activating the service for the first time, you will receive voice instructions. Service is compatible with Remote Call Forwarding. Centrex subscribers (only): Effective 1/25/11, please call Customer Care during business hours to change your call forwarding number. 7 Call Waiting You ll know when another caller is trying to reach you. You can use your telephone without missing other calls. A special tone alerts you to a waiting call; the person calling you hears a normal ringing. To answer a waiting call: 1. When you re on the phone, a special tone ( beep ) tells you a second call is waiting. 2. Simply press and quickly release the switchhook on your telephone. Your first caller is automatically placed on hold, while you re connected with the second caller. If you choose not to answer the incoming call: You ll hear a special tone to remind you of the waiting call. To alternate between callers: Simply press and quickly release the switchhook. While you talk with one caller, the other will automatically be placed on hold. Each conversation remains private. To end either call: 1. Hang up. 2. Your phone will ring. 3. When you answer, you ll be connected with the remaining caller. To turn off Call Waiting before making a call: 1. Lift handset and listen for dial tone. 2. Press * Listen for the confirmation tone, followed by dial tone. 4. Dial the telephone number you wish to call. Now, you call will not be interrupted by the Call Waiting tone. Other callers will hear a busy signal. To turn off Call Waiting during a call: 1. Press and release the switchhook. This will place your active call on hold. 2. Press * Listen for the confirmation tone. 4. Press and release the switchhook to reconnect to the call on hold. 5. After you hang up, Call Waiting automatically turns on again. This service will interact with 3-Way Calling. The switchhook is the button the handset pushes down when you hang up the phone. Some telephones have a Link or Flash key you can press instead. Caller ID and Calling Name ID See the caller s identity before you answer the phone. 8 When you receive a call with Caller ID you will see the calling party s phone number; and with Calling Name ID you will see the calling party s name and/or phone number on the display screen of your phone or device (unless the calling party has requested call blocking on their number). 1. When you receive a call, wait until your telephone completes the first ringing signal. 2. The name and/or telephone number of the person calling you will automatically appear on your display screen or Caller ID unit. 3. If you choose to answer the call, the number will remain on the screen until you or the caller hangs up. Subscription to Caller ID requires the purchase of a digital display telephone or an add-on display unit. If the word Private appears on your screen, the caller may have blocked the display of their number by pressing *67 before placing the call. You can choose whether or not to answer the call. If unknown name, unknown number, out of area, or 0 appears, the caller is in an area that does not support Caller ID services. Caller ID Complete Blocking and Selective Blocking Block and unblock your number display to others. CALLER ID COMPLETE BLOCKING Your caller ID is shown as private to others until you choose to reveal your Caller ID. If you have requested Complete Blocking from your Telephone Company you do not need to dial a code to block your number each time. Your number will always appear as private. There may be times you wish to have your number appear on an individual basis, as in the case where the number you are calling does not accept calls from blocked or unknown numbers. When this occurs you will hear a message instructing you to dial *82 before placing your call again. To unblock your number on an individual basis: 2. Press *82 to reveal your Caller ID. 3. Dial the number you wish to reach. CALLER ID SELECTIVE BLOCKING Your Caller ID is revealed to others until you choose to block your Caller ID. 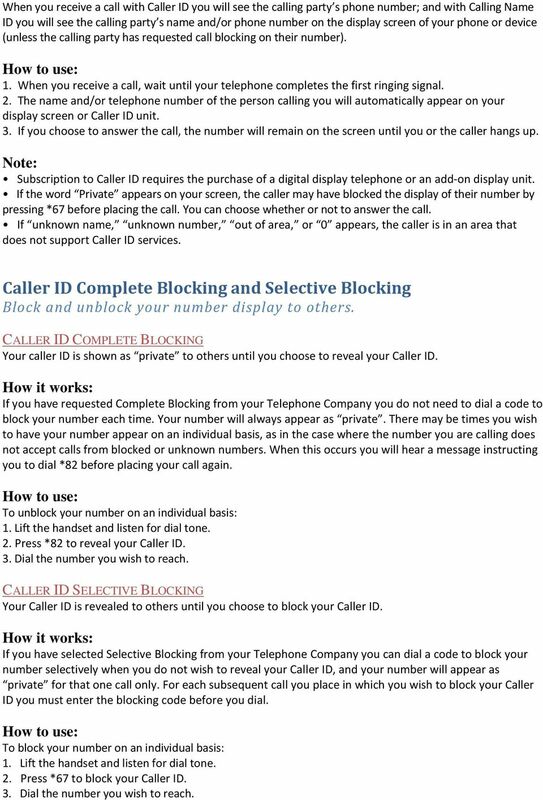 If you have selected Selective Blocking from your Telephone Company you can dial a code to block your number selectively when you do not wish to reveal your Caller ID, and your number will appear as private for that one call only. For each subsequent call you place in which you wish to block your Caller ID you must enter the blocking code before you dial. To block your number on an individual basis: 2. Press *67 to block your Caller ID. 3. Dial the number you wish to reach. 10 A. Administrator: enter conference ID and Administrator ID at prompts. Conference will begin when Administrator arrives. Click on Call Manager heading to view/manage the attendees and activate recording. B. Participants: enter conference ID at prompt. End a Conference A. When Terminate When Admin Leaves is set to Yes, simply hang up. * B. When Terminate When Admin Leaves is set to No the conference ends when the last participant hangs up. 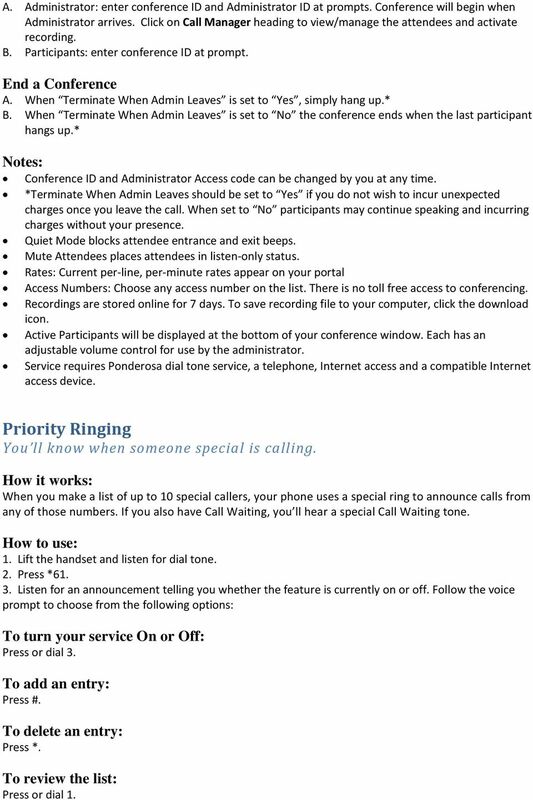 * Notes: Conference ID and Administrator Access code can be changed by you at any time. *Terminate When Admin Leaves should be set to Yes if you do not wish to incur unexpected charges once you leave the call. When set to No participants may continue speaking and incurring charges without your presence. Quiet Mode blocks attendee entrance and exit beeps. Mute Attendees places attendees in listen-only status. Rates: Current per-line, per-minute rates appear on your portal Access Numbers: Choose any access number on the list. There is no toll free access to conferencing. Recordings are stored online for 7 days. To save recording file to your computer, click the download icon. Active Participants will be displayed at the bottom of your conference window. Each has an adjustable volume control for use by the administrator. Service requires Ponderosa dial tone service, a telephone, Internet access and a compatible Internet access device. Priority Ringing You ll know when someone special is calling. When you make a list of up to 10 special callers, your phone uses a special ring to announce calls from any of those numbers. If you also have Call Waiting, you ll hear a special Call Waiting tone. 2. Press * Listen for an announcement telling you whether the feature is currently on or off. Follow the voice prompt to choose from the following options: To turn your service On or Off: Press or dial 3. To add an entry: Press #. To delete an entry: Press *. To review the list: Press or dial 1. 11 To hear the options announcement again: Press or dial 0. If the Priority Call list is empty, you must add an entry to the list before activating the service. If you delete all entries in the Priority Call list and hang up, the service is automatically deactivated, if it was previously active. Selective Call Acceptance Decide which calls you ll take. You can program your phone to accept only those calls from a special list of up to 10 people. When your service is turned on, your phone will accept only calls from those in your Selective Call Acceptance list. All others will hear an announcement that you re not accepting calls at this time. To turn on the service: 2. Press * Listen for an announcement telling you whether the feature is currently on or off. The recorded voice will then tell you how many (if any) numbers are currently stored in your acceptance list. Follow the voice prompt to choose from the following options: To turn your service On or Off: Press or dial 3. To add and entry: Press #, dial the number as you normally would, then press #. To delete an entry: Press *, dial the number as you normally would, then press *. To review the list: Press or dial 1. If the Selective Call Acceptance list is empty, you must add an entry to the list before activating the service. If you delete all entries in the Selective Call Acceptance list and hang up, the service is automatically deactivated, if it was previously active. Selective Call Rejection Don t let unwanted calls disturb you. 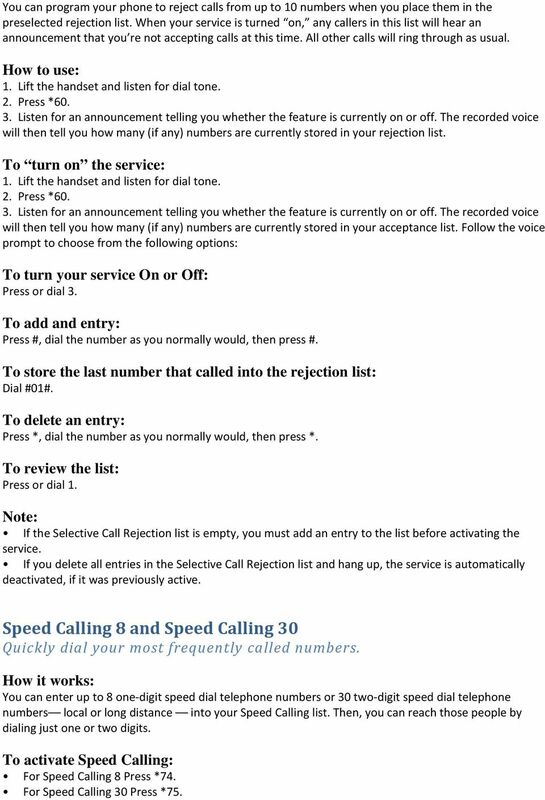 12 You can program your phone to reject calls from up to 10 numbers when you place them in the preselected rejection list. When your service is turned on, any callers in this list will hear an announcement that you re not accepting calls at this time. All other calls will ring through as usual. 2. Press * Listen for an announcement telling you whether the feature is currently on or off. The recorded voice will then tell you how many (if any) numbers are currently stored in your rejection list. To turn on the service: 2. Press * Listen for an announcement telling you whether the feature is currently on or off. The recorded voice will then tell you how many (if any) numbers are currently stored in your acceptance list. Follow the voice prompt to choose from the following options: To turn your service On or Off: Press or dial 3. To add and entry: Press #, dial the number as you normally would, then press #. To store the last number that called into the rejection list: Dial #01#. To delete an entry: Press *, dial the number as you normally would, then press *. To review the list: Press or dial 1. 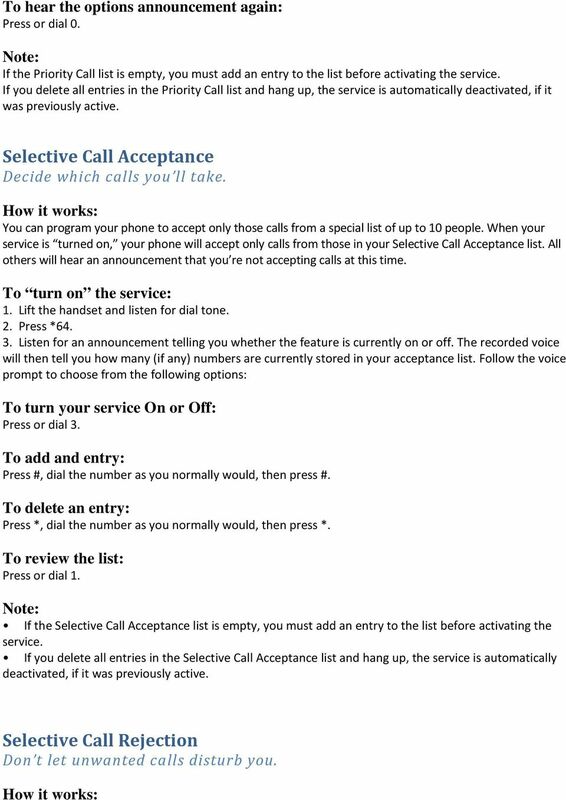 If the Selective Call Rejection list is empty, you must add an entry to the list before activating the service. If you delete all entries in the Selective Call Rejection list and hang up, the service is automatically deactivated, if it was previously active. Speed Calling 8 and Speed Calling 30 Quickly dial your most frequently called numbers. You can enter up to 8 one-digit speed dial telephone numbers or 30 two-digit speed dial telephone numbers local or long distance into your Speed Calling list. Then, you can reach those people by dialing just one or two digits. To activate Speed Calling: For Speed Calling 8 Press *74. For Speed Calling 30 Press *75. 13 To program your Speed Calling list: 2. Press *74 or * Listen for dial tone. 4. For Speed Calling 8 dial a one-digit speed code. (Choose any number, 2 through 9.) For Speed Calling 30 dial a two-digit speed code (Choose any number, 20 through 49.) 5. Dial the telephone number you wish to assign to that speed code. (For long distance calls, be sure to include 1 plus the area code.) 6. Press the # key. 7. Listen for the confirmation tone. Hang up to complete the entry. To call someone on your Speed Calling list: 2. Dial the speed code, and then press the # key. To review your Speed Calling list: 2. Press *78 or * You will hear an announcement of the numbers on your Speed Calling list. To change your Speed Calling list: 2. Press *74 or * Listen for dial tone. 4. Dial the one-digit speed code you wish to change. Three-Way Calling Talk with two people in different places at the same time. When you re talking with someone, you can add a third person to the call. It s easy to coordinate family schedules or hold a telephone conference with business colleagues. To add a third person to the call: 1. Press and quickly release the switchhook to place the first person on hold. 2. Listen for dial tone. 3. Dial the third person s phone number. 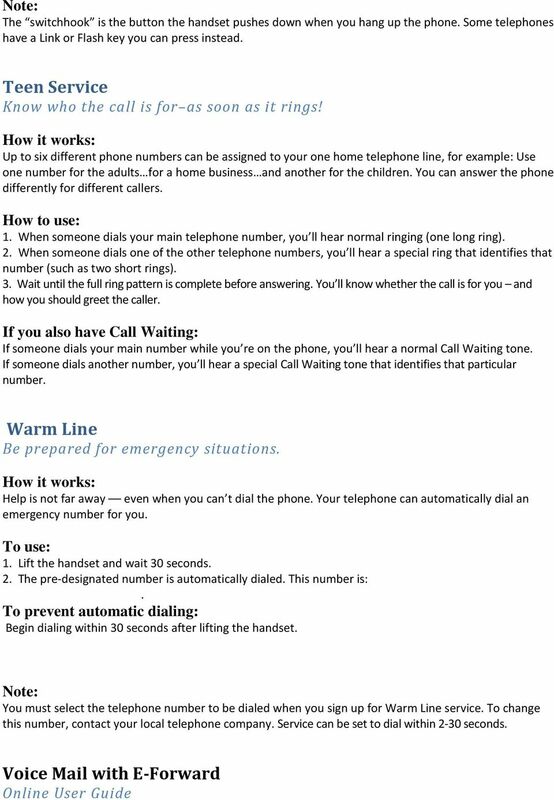 (If you have speed calling, you may dial one of your codes instead.) 4. When the third person answers, you can talk privately before making it a three-way conversation. 5. To make the three-way connection, press and quickly release the switchhook. You can now talk with both people at the same time. To cancel the three-way connection: 1. If the third person did not answer or you wish to disconnect them, just press and quickly release the switchhook. You ll be reconnected to the person holding. 2. Or, if either of the two people hangs up, you can continue talking with the remaining person. To end the call completely: Simply hang up. User Manual. Everything you need to know about your new digital telephone service! User Manual Everything you need to know about your new digital telephone service! Introduction Dear Cox Customer: Welcome to a better choice in local and long distance phone service and a better value! CALLER I.D. Allows you to see the number and name if available of the incoming call.